The Pensacola Lighthouse & Museum is located on Naval Air Station Pensacola adjacent to the National Naval Aviation Museum. The tower was built in 1859, and has a spectacular view of the Gulf Coast. You can climb up the 177 steps to the top of the lighthouse. The museum used to be the lighthouse keeper's living quarters, and was built in 1869. The lighthouse and museum are open to the public 7 days a week. Call 850-393-1561 for specific information. You can climb the 177 steps to the top of the lighthouse where you have a fantastic view of Pensacola Pass, Pensacola Bay, three historic forts, the downtown skyline of Pensacola, and the historic Navy Yard. Your admission fee also covers the museum and its exhibits. The lighthouse and museum are open to the public 7 days a week. 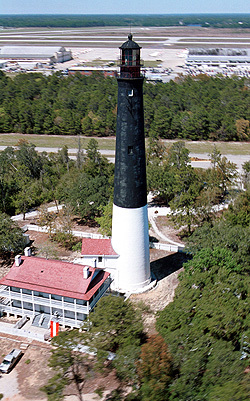 More information about the lighthouse and its various events is at the Pensacola Lighthouse and Museum website.